One great way to change the look of any golf cart is to add a lift kit. Most any brand of golf cart has lift kits available that are simple bolt on applications there is no welding or cutting required and with a few hours on a Saturday you can truly change the look of your golf cart. What kind of golf cart lift kit should I buy? 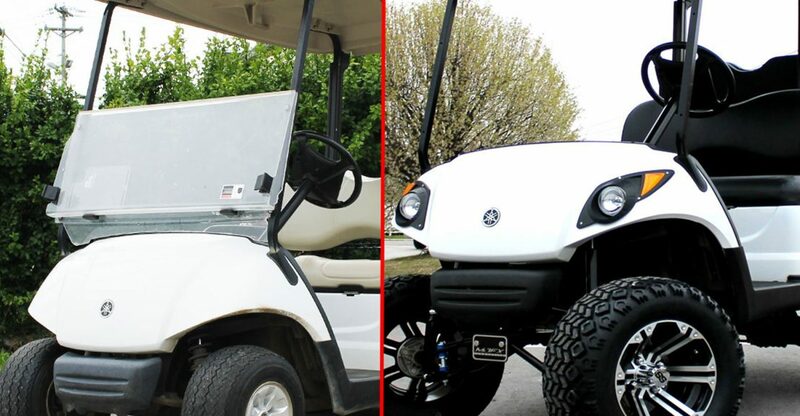 There are a couple different kinds of golf cart lift kit styles worth mentioning. 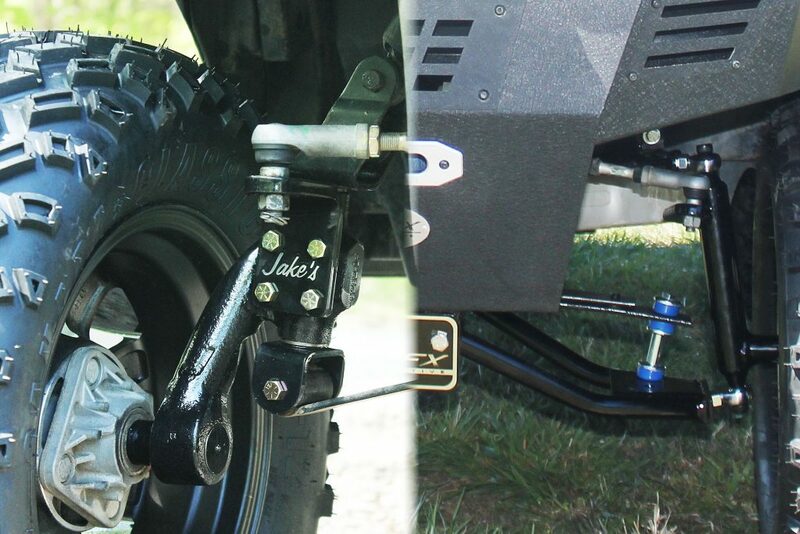 One being the A-Arm lift kit, and the other being the drop spindle or drop axle lift kits. If you have an EZGO TXT golf cart, it does not have an independent a-arm front suspension, so the lift kits available for it are going to be either the drop axle style lift kits or the drop spindle style lift kit. With either drop Axle or drop spindle lift kits, the factory screens are still going to be used during the installation. The drop Axle lift kit will require much more labor than the drop spindle lift kit. At McCulley’s golf cars we generally install Axle Lift Kits on the EZGO TXT’s, simply because we prefer the look over the spindle drop lift kits. All of the other Golf Cart that are very common at all, like the Club Car DS, Club Car Precedent, E-Z-Go RXV and Yamaha Drive Golf Carts are going to have an a-arm front suspension. So for these golf carts you would be choosing between the a-arm lift kits and the drop spindle lift kits. The way a drop spindle lift kit works, is by replacing the factory spindle with a spindle that drops down however many inches the lift is, such as 3 inches or 6 inches. The great thing about these golf cart lift kits is the ease of installation. To install these, the only thing you have to remove is the hub and spindle off of the front suspension. So the drop spindle golf cart lift kits are very easy to install. The potential downside however is that you do keep all of the original suspension on the front other than the spindle. If you’re just driving your cart around paved areas and not using it as an off-road cart, this is fine. But, if you are using your cart off-road, you are going to want a heavier-duty suspension then the original Factory front a-arms. This is where the a-arm lift kits come into play. A-arm lift kits replace the entire front suspension. Generally speaking a-arm lift kits come with new shocks and new springs. We typically use the MadJax MJFX 6in or 4in double a-arm lift kits that have a double leaf spring across the front and brand new shocks included. MadJax kits are very easy to install, and come with very clear instructions. There is a potential downside to installing the double a-arm lift kit if you are going to be mainly driving your cart on the road or concrete/paved areas. The leaf spring that comes with the double a-arm lift kits from MadJax is a very thick strong spring that is much stiffer than the factory suspension. This is great for off-road. However, for driving your cart on paved and concrete areas the factory suspension would be much smoother. Really, when it comes down to it it’s all a matter of personal preference. There is not one lift kit style that surpasses the other in every way. There are pros and cons to each one and you simply have to choose which is best for the way you are going to be using your cart, or for the look you want to achieve with your lift kit. As a rule of thumb, if you want to use 22 to 23 inch tires then you need to go with a 6in lift kit no matter the style. If you would like to go with a 20 to 21 inch tire then you could likely get away with a 3in or 4 inch lift kit. For E-Z-Go TXT golf carts, typically you can fit an extra inch or two of tire under the wheel wells. It all just depends on how much the springs on the golf cart have worn. On this page (Click Here) I have links posted to all of the lift kits that we would typically use on the golf carts that we sell here in the store as well as some other products that may be interesting to you. If any of the information you gain from our site helped you in making a decision, please help us out by checking out the products on this page. If you are local to the Crossville Tennessee area, we keep most of these items in stock at all times. If you are an out of the area customer and ordering your golf cart lift kit online, we are still very happy to answer any questions you have on installing or choosing your lift kit. Thank you for stopping by.